PHOENIX � The long-awaited prime camping season is here and the Arizona Game and Fish Department wants to remind people heading into the cool, high country to be bear aware and keep a clean campsite. "The root cause of most conflicts between bears and people, especially in camping areas, is food. Bears can�t change their behavior, but people can," says Bruce Sitko, a Game and Fish Department public information officer in the Pinetop regional office. Prolonged drought and the subsequent decrease of food growing in the wild have Game and Fish Department biologists concerned about a possible increase in bear-human encounters this year. Bear calls are already on the rise from residents in some mountain communities. Recently, a young black bear attacked and slightly injured a 14-year-old boy who was out camping with friends along the Gila River near Hayden. State wildlife authorities say the attack and other incidents highlight the need for campers and other outdoor recreationists throughout the state to be bear aware this season. "Fortunately, the young man only sustained minor injuries from the bear attack. Hopefully, this incident will raise people�s awareness about the potential of increased human-wildlife interactions this year due to the prolonged drought. 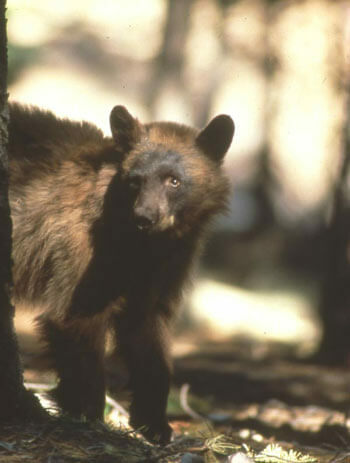 Black bears should always be considered unpredictable and dangerous to people," says Randy Babb, an Arizona Game and Fish Department spokesperson. Babb explained that during the winter-spring of 2004-05, the state experienced record rainfall, and the available food stuffs for bears and other wildlife species was terrific. Last year, biologists noted lots of bear sows with two cubs. Those cubs are now hungry yearlings actively searching for something to eat. As a result, bear calls and incidents are on the increase in many areas of the state. "We have had a number of recent human-bear incidents around the state. If you go camping, be sure to be bear aware," says Babb. In another recent incident, in the area of Clear Creek Estates between Flagstaff and Payson, a bear approached a boy and girl sitting on their father�s pickup and the children ran. The bear chased the young girl to within 10 feet of her father, who yelled at the bear. The bear stopped and stood its ground for some time, before finally wandering off. Wildlife authorities are actively searching for the aggressive bear. * Never intentionally feed wildlife. * Keep a clean camp. * Do not cook in your tent or sleeping area. * Store all foods, toiletries and other scented items well away from sleeping areas and unavailable to bears. * Wash up, change clothing and remove all scented articles before retiring to your sleeping area. * Walk or jog in groups. Pay attention to your surroundings when hiking, jogging or bicycling. * Supervise your children and keep them in sight. * Keep your pets on a leash � don�t allow them to roam free. Or better yet, leave them at home if you can. Pets can easily get into conflicts with a wide range of wildlife from skunks to coyotes. But if you are confronted by a bear, never, ever run. Try to make yourself look as big and imposing as possible. Stay facing the animal. Throw something at it. Speak and let it know you are human. Loud noises can help. Try clanging pans, using air horns, or whatever is available.